The Handala Center for Prisoners and Former Prisoners said that the strike was launched in response to the Israel Prison Service’s reneging on previously agreed-upon understandings to lessen the level of repression imposed on the prisoners. Specifically, Allam Kaabi said, the prison administration had previously agreed to make telephone calls available to all except for those classified by the occupation as “security matters,” but then disavowed that understanding. The prisoners are represented by a leadership group representing all political forces; Ahmad Sa’adat, Palestinian national leader and the imprisoned General Secretary of the Popular Front for the Liberation of Palestine, is part of this coordinating committee. The strike comes one day before the Israeli elections, in which a slew of right-wing candidates have competed with one another to pledge harsher attacks against the Palestinian people, including Palestinians in Gaza and Palestinian political prisoners. These repressive attacks have included multiple invasions of prisoners’ cells, rooms and sections by heavily armed repressive units. Prisoners’ belongings have been searched and confiscated, while multiple prisoners have been transferred from section to section. Prisoners have been beaten by these forces, who have also fired tear gas within the confined space of prison sections, leading to multiple injuries. Thouands of books have been confiscated from the prisoners, while family visits have been banned for many prisoners, especially those associated with the Hamas movement. In addition, devices such as surveillance cameras and alleged mobile-phone jammers have been installed in the prisons, further elevating the level of surveillance faced by the prisoners. These attacks have come under the banner of Erdan’s committee to “examine the conditions of the prisoners” in order to “impose a new reality” on Palestinian prisoners – precisely designed to roll back the rights that the prisoners have only won through years of struggle, including hunger strikes and other protests. The prisoners’ demands include: the installation of public telephones in the prisons to allow them to communicate with their families, the removal of the jamming devices, the return of family visits to normal and the abolition of all of the repressive measures, sanctions and penalties imposed on the prisoners. According to breaking news reports from Palestine, key leaders of the prisoners’ movement and the Palestinian national liberation movement as a whole have joined the strike and hundreds are planning to join the strike in the coming days. The strike is planned to escalate on 17 April, marked in Palestine and internationally as Palestinian Prisoners’ Day. There are currently around 5,500 Palestinians held in Israeli jails, including 48 women, 230 children and nearly 500 held without charge or trial under indefinitely renewable administrative detention orders. Samidoun Palestinian Prisoner Solidarity Network expresses its strongest support for the Palestinian prisoners’ movement as it launches this critical battle for dignity and justice. We urge people around the world to take action to support the prisoners’ strike and join their struggle. The Palestinian prisoners will not be isolated or left alone! International solidarity is critical to building support, attention and pressure to help them achieve their demands. 1) Organize or join an event or protest for the Palestinian prisoners. From today, organize demonstrations, actions and events and join in the Prisoners’ Week of Action from 17 to 24 April 2019! You can organize an info table, rally, solidarity hunger strike, protest or action to support the prisoners. If you are already holding an event about Palestine or social justice, include solidarity with the prisoners as part of your action. Send your events and reports to samidoun@samidoun.net. 2) Write letters and make phone calls to protest the violation of Palestinian prisoners’ rights. 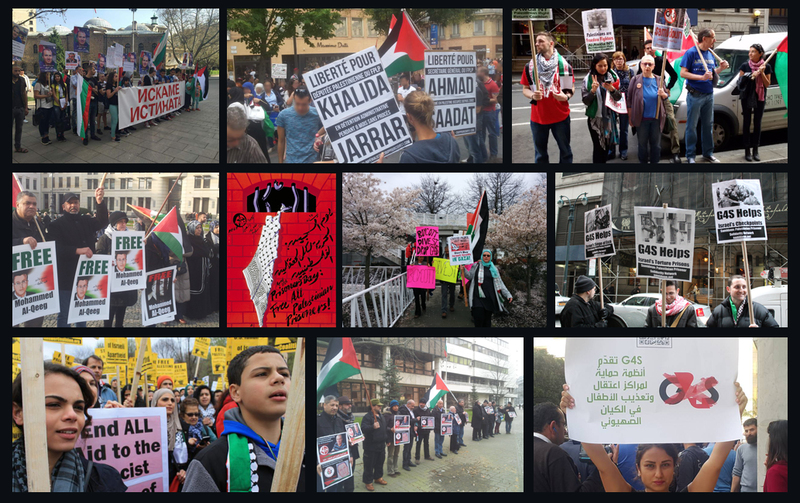 Demand your government take action to stop supporting Israeli occupation or to pressure the Israeli state to end the policies of repression of Palestinian political prisoners. 3) Boycott, Divest and Sanction. Join the BDS campaign to highlight the complicity of corporations like Hewlett-Packard and the continuing involvement of G4S in Israeli policing and prisons. Build a campaign to boycott Israeli goods, impose a military embargo on Israel, or organize around the academic and cultural boycott of Israel.